June 30, 1997. The last day of British rule in Hong Kong. The day was filled with pomp and ceremony, as British flags were taken down throughout Hong Kong and British military personnel marched in Hong Kong one last time. 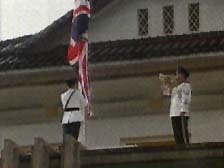 At the Hong Kong governor's mansion, Hong Kong police in dress uniform took down the Royal Jack. 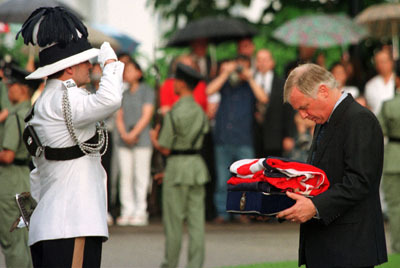 The flag was then presented to the last British governor of Hong Kong, Christopher Patten. Standing solemnly in the rain was onlookers watched, the governor seemed saddened, with tears in his eyes as the Hong Kong Royal Police band played its tune. In his five years as governor, Mr. Patten had pushed through democratic reforms in Hong Kong's government. 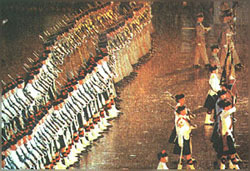 Later, the British held a farewell ceremony at their base HMS Tamar in the pouring rain.